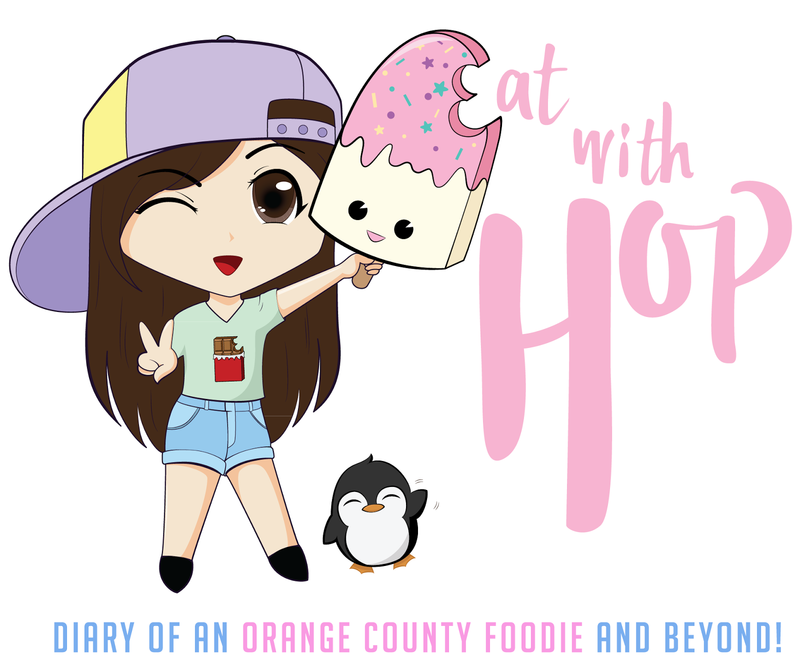 Photo Diary | My 36th Annual UVSA Tet Festival of Orange County Recap - EAT WITH HOP! Have you attended the UVSA Tet Festival 2017 yet? I went to the festival with Kevin and Cristina on it's opening day (Friday) which started at 4pm! I came at around 4:45 pm surprised that a lot of the festival was still actually setting up! It also got dark fast and the areas that weren't done setting up looked lonely! I'm sure it would be more lively on the Saturday and Sunday though especially in the daytime since the fest starts at 11am. Our goal was basically GET ALL THE FREEBIES! We love spinning all the wheels from plenty of booths to get prizes like pens and pencils or hand sanitizer and such. Last year, there were red envelopes filled with actual money and Kevin and I both got a dollar! This year I didn't see that booth. Drats! I picked a red envelop from several booths and one of them had a free lunch gift card to a restaurant inside 4 Points Sheraton Hotel in Anaheim! YESS!! Everyone was a winner too! Kevin won free lunch up to $12 and Cristina won a gift card for $5 worth of food. Twas a good start. Entering the annual 36th Annual UVSA Tet Festival! Plenty of food booths to explore and eat at! We tried Crescendo Ice Cream, known for liquid nitrogen ice cream and "heaven breath" which are liquid nitrogen cereal puff balls! The Menu at Crescendo Ice Cream has a variety of ice cream flavors and drinks! Crescendo Ice Cream has this new item on the menu! The Artist Palette! It's basically flavored condensed milk dipping sauces for the Heaven Breath dessert! It's so creative and has no added food dyes! Not so crowded on this chilly and windy day. There is also a booth that serves italian ice! WARNING: DO NOT HOLD THE "ARTIST PALETTE" FROM CRESCENDO IN A WAY THAT DIRECTLY TOUCHES THE CUP. IT'S HELLA COLDDDDDDD AND MAY BURN YOU. Maybe not burn, but it's definitely not.... bearable. So The "Heaven Breath" from Crescendo Ice Cream is basically cereal puff balls filled with liquid nitrogen so that when you bite into these, you can breathe out "smoke" resembling "heaven breath"! Pictured below is the Oreo Flavored Ice Cream! It was sorta fruity and reminded me of like lychee jelly you get from boba shops or yogurtland toppings fused with oreos. Has anyone ever tried bread with ice cream?! I personally have when I was a child! I don't know why, but I just decided it would be good as an ice cream sandwich and it's delicious! Like cake with ice cream but it's in bread - sandwich form! I'm glad Crescendo brings that concept to life (wish I could have made bank on this first though...haha!) by bringing sweet bread to ice cream! They also have matcha latte! It was just aiiiiiiiiight. These takoyaki (balls of flour filled with octopus) are so worth it! The line wasn't long at all and we got the food super quick! It comes with 8 balls for about $6! What a freaking steal! I absolutely recommend these to anyone and everyone! The food selection here included sugarcane juice, takoyaki, milk tea, and even drinks in light bulb bottles. Most of the booths barely had any lines. I guess it was just too chilly and windy to come out and play. I was so cold myself! There was a booth selling rice cakes with filling! I recommend just going to The Loop Churros if you wanna try these because it's much more fresh at The Loop (in Westminster). These Korean Bulgogi Elote fries were sooooooo delicious! We got extra chili powder because we love spicy! Love how it actually tastes like we are eating the Mexican corn but with fries! The Pop'd Up booth was here too selling some colorful drinks in their famous bottles. This is where you can score an assortment of free instant noodles! We were all wondering why there was even a line and why it took so long... but it was because they do a raffle here! I picked out a random ticket and WON AN ENTIRE PACK OF HAO HAO INSTANT NOODLES! This is the pack of Hao Hao instant noodles that I won! Hope they are good. Unfortunately it's product of Vietnam and I don't really trust that.... but.... I won't die right? HMMMMM.. WILL GIVE IT A SHOT ANYWAY. The goodies I came back home with! Free drawstring backpacks, reusable bags, a looooooot of instant noodles and pens and pins and more! I also got a free Rooster piggy bank (not pictured) from Wells Fargo and a 2017 calendar! Expect prices to be "festival" prices. Most things rae $5 or more. BRING CASH!! if you don't take advantage of freebies... why even go? LOL JK! tons of freebies! Spin every wheel! Artist Palette + Heaven Breath: not much flavor from the dipping sauces besides that the grape flavor. They are all very sweet. Heaven Breath (the puff balls) need to be eaten quick or else it will lose the liquid nitrogen breath effect. We couldn't get any good photos. DRATS! Overall, palette isn't worth it but I would recommend the heaven breath if you wanna have fun and blow some smoke. Matcha Oreo Ice Cream: Pretty good but the fruity tea medly flavor fused with the matcha made a strange combination that didn't taste much like matcha and instead tasted more fruity. Oreo Ice Cream: Made with the same fruity tea medly fused flavor. This did not taste like cookies and cream at all so don't expect that. It actually tastes like fruity tea or lychee or something similar with some oreos. The fruity tea thing is overpowering in this!! Matcha Latte: Tastes artificial and candy like matcha. I am a matcha snob and would not recommend this. so so worth! It comes with 8 balls of takoyaki for around $6. No wonder there is always a line!! also worth it in my opinion! I would get this again! Tastes exactly like Mexican corn with fries AND bulgogi meat! YAY! Located at the OC Fairgrounds in Costa Mesa!